The night I served this sauce, one of my guests walked through my door and said, “It smells like an Italian restaurant in here!” When you have a pot of this meaty, succulent sauce simmering on your stove, you’re house can’t help but smell delicious. My sister’s mother-in-law, Carrie, graciously shared her spaghetti sauce recipe with me. It’s absolutely famous in their family! This sauce has everything! There’s meat and sausage. Parmesan cheese and roasted garlic. Bright tomatoes and, of course, a dash of good red wine. Talk about depth of flavor! We serve this sauce with spaghetti pasta, which my kids love, but this would be great on anything from tagliatelle to penne. Really, I think I need some of this sauce in my freezer at ALL TIMES. It freezes extremely well. When Carrie’s two boys were away at college, she would send them back to school with frozen batches of spaghetti sauce. Now that’s love! Turn oven to 375 F. Cut the top off a whole bulb of garlic. Place bulb of garlic in a square of aluminum foil. Drizzle with olive oil. Fold the aluminum foil up over the garlic bulb and seal the edges to form a packet. Then place the packet in the oven for about forty-five minutes. When you pull the garlic out, let it cool a bit, then squeeze the roasted garlic out of each clove. Mash the roasted garlic with a fork. Heat a large stock pot on medium heat. Brown the sausage and ground meat. While the meat is browning, chop the onion. Do not drain the meat. Add onion and anchovy paste to the meat in the pot and cook for an additional four minutes. Add tomato paste and stir well. Add roasted garlic, and Italian seasoning. Mix and heat thru. Pour in 1/3 cup wine or more to taste. 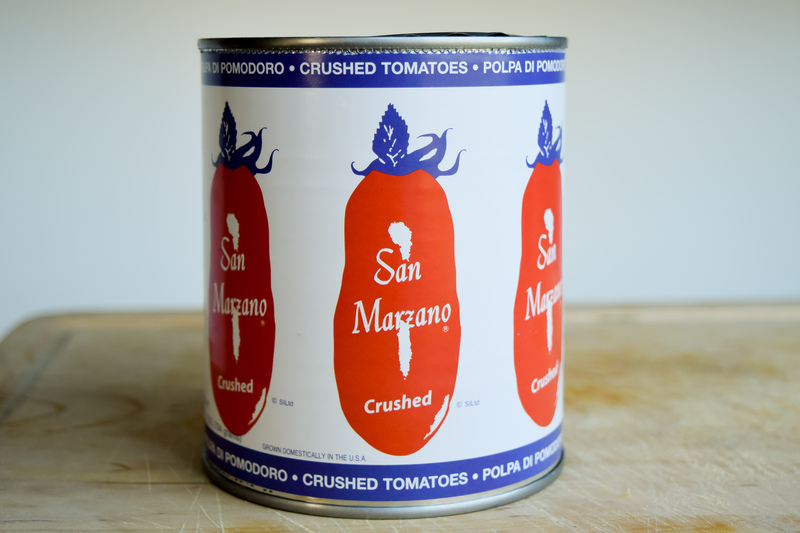 Add Prego and crushed tomatoes. Simmer for two hours on very low heat, watching carefully to avoid scorching. Add 1/2 cup parmesan cheese to the sauce about an hour before serving. Be careful since the sauce burns more easily after the cheese is added. Make sure to taste to check the seasonings. Do not add more salt until after you have added the parmesan as the cheese is salty. As Carrie says, “It only works, if it’s full of love!” Enjoy!! 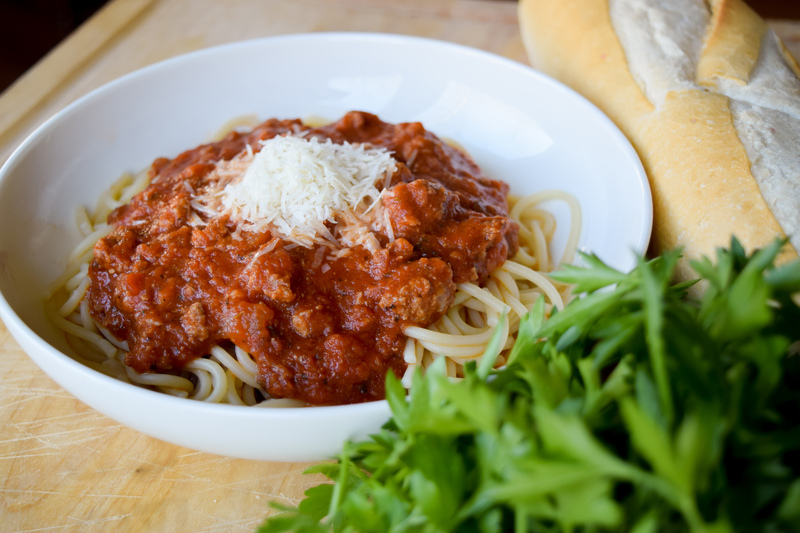 Tags: bolognese, freezer meal, italian dinner, meat sauce, pasta, spaghetti sauce. Bookmark the permalink. Looks so amazing, I can almost smell it! As one of the lucky ones who got to eat this amazing dish I can honestly say it was the best spaghetti I have every had. Thanks, Elizabeth! One of my favourite dishes. Thanks for sharing this version.